I may spend the better part of a full-life career in education contemplating and practicing PBL. Personally and professionally, I find PBL fascinating and a critical component to all this talk about 21st century teaching and learning, as well as to school transformation. For me, I can think of at least a few major waypoints on my path of better understanding the depth and breadth of PBL. Serving in a sabbatical that was largely geared to understand more of how the “real-world” works in projects. Watching my two sons, currently ages 7 and 4, emerge in the world as master learners…simply because they are humans. Realizing in a “duh” moment, that has lasted for years, that their learning is primarily project-based…or passion-based…or problem-based…or place-based. And starting #FSBL (Father-Son Based Learning) as a Twitter hashtag to chronicle some of how my sons and I explore and discover in order to learn stuff that fascinates us! Reading, studying, and immersing myself in the book The Falconer, by Grant Lichtman (who is now an invaluable colleague). Participating in the TEDxAtlanta community and forging a relationship with Gever Tully, now of The Brightworks School. Undertaking a multiyear project to operationalize my research in 21st century learning – and to enact a Falconer-type class – by creating and co-facilitating a course known as Synergy (community-issues problem solving, transdisciplinary, non-graded but heavily assessed). Connecting with Jonathan Martin, currently at St. Gregory School – especially over a blog-based discussion about PBL (examples here and here). And, in the last month, I may just have added another significant waypoint on my path to understand better the depth and breadth of PBL. In September 2010, I read an article in Educational Leadership, but I have only recently returned to the article to study it intensely – because my team of PLC (Professional Learning Community) facilitators is using the article to support the creation of a lesson study devoted to PBL. “7 Essentials for Project-Based Learning,” John Larmer and John R. Mergendoller, Educational Leadership, September 2010, Vol. 68 No. 1, http://www.ascd.org. In my opinion, there are sound reasons why teachers and schools should pursue projects all along this spectrum. There are appropriate times for operating in the lower left quadrant, as well as appropriate times for operating in the upper right quadrant. But the more we work in the upper right quadrant, the more that we uppercase and capitalize the PBL. Ultimately, if education and learning are about making a positive difference in this world, then perhaps we are all striving to engage in more work at the upper right quadrant. What’s Coming Up on It’s About Learning? How I use observation journaling to discover and ideate about possible PBL opportunities… Stay tuned! This entry was posted in 21st C Learning, CBL, DBL, PBL and tagged PBL by boadams1. Bookmark the permalink. Bo, I enjoyed your post. I wish that I had found it sooner and now I am looking forward to reading more of it. In your reply to Megan’s comment you seem to be suggesting a nuance to teaching and learning and citizenship through authentic problem solving: service-learning. 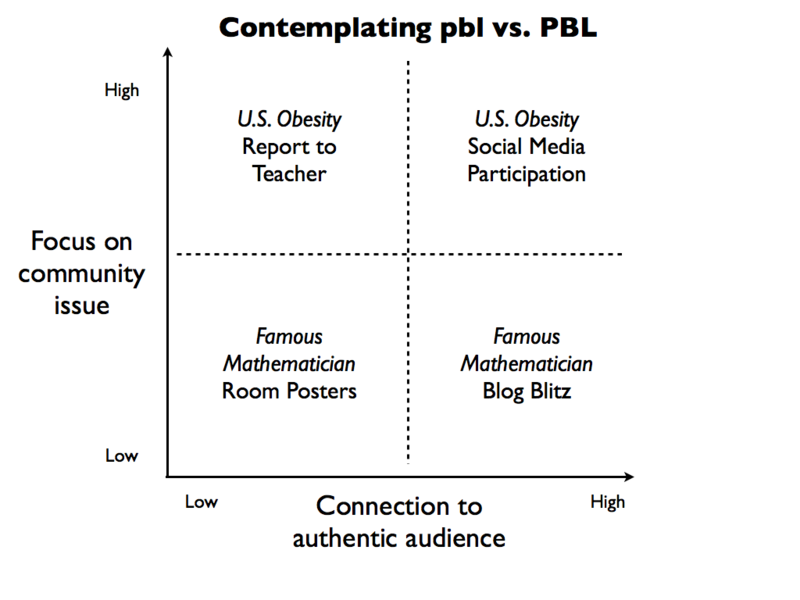 I worry a bit about simplifying pbl/PBL to the two categories of community issues and authentic audience…yet you do mention exploring some of the other factors in future posts. I wonder if those two issues are the “easiest” entry points for educators who wish to progress from pbl to PBL? Or are there other paths that draw upon past experience(s) (FSBL-type examples even) which provide a greater “hook” for PBL vs. pbl. Thoughts? Megan, thanks for taking time to read my post and comment. The discussion of PBL with amazing educators and thinkers is invaluable to me. I wholeheartedly agree that it is oversimplifying to reduce pbl/PBL to two dimensions. I truly believe that pbl/PBL is multidimensional and multifaceted. However, a 2×2 grid exploration is a starting place of sorts to “picto-fy” and “infographic-fy” the core of the message in the EL article. And I do think that PBL becomes more meaningful, relevant, engaging, and world-applicable the more that such structured learning advances problem-addressing of real-world issues that our communities have to face, as well as facilitating the participation/communication of students with those authentic community audiences. Our world – subdivided into its countless community cells – faces serious issues of various magnitudes. I think school curriculum and instruction could be more purposefully geared towards students taking DIRECT part in efforts to address those issues – whether they be more directly involved in the issues that are typically handled by adults in schools (campus design/use, economic/environmental sustainability, policy determination/implementation, event/program planning, etc.) and/or whether they be more directly involved in exploring and participating in Atlanta/national issues (homelessness, water conservation, city planning, the next mobile technology, etc.) To put it simply, I merely want school better to approximate the ways we learn deeply before and after formal schooling. I am wanting citizenship, not just residency. Don’t forget Peanut Butter Learning, in which student projects are sponsored by JIF and Skippy.